As we gather round the table and relatives share embarrassing stories of our youth, we are also scouring ads, websites and our feeds for good shopping deals this holiday season. The near-term outlook remains bright. According to the latest CPI figures, whole, frozen turkey prices are down about 4 percent year-over-year. More importantly jobs and incomes are up and gas prices are falling, setting the stage for solid holiday spending this year. Over the past couple of years there has been a big debate raging on the outlook for traditional retail versus the rise of e-commerce, or online sales. At this time of year you can think of this as Black Friday versus Cyber Monday. Although at this point, those distinctions are pretty much meaningless. Anyway, the conventional wisdom has settled on the retail apocalypse narrative. Traditional brick and mortar retailers are the walking dead, whether they know it or not. Now, we have seen hundreds of big retail stores close in recent years, in addition to a few high profile bankruptcies. However, this isn’t about e-commerce, given such sales are just now approaching 10 percent nationwide. The rise of e-commerce plays a role, but a minor one. The big underlying issue behind the bankruptcies seems to be corporate finance, specifically debt problems due to past buyouts and restructuring. Some store closures are tied to sales in general given local economic conditions and population declines. That said, whatever the underlying cause, store closures impact the workers who lost their jobs, and communities that lose their downtown or shopping center anchors. What gets lost in the e-commerce versus brick and mortar discussion is the fact that large portions of retail continue to do well. This includes auto dealers, grocery and home improvement stores in particular. That said, the segments most exposed to online competition — things like books, sporting goods, clothing and the like — have seen less growth, even some declines, but are not (yet) plunging. The apocalypse narrative is overblown today. 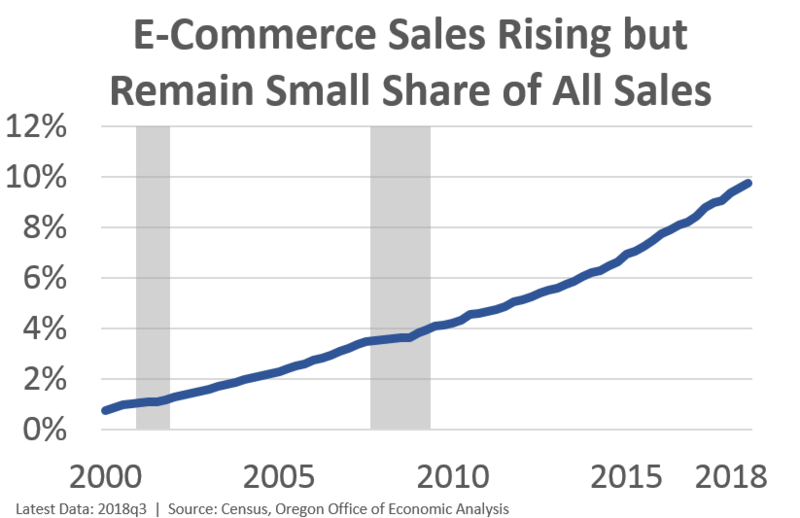 However, employment at e-commerce firms, or sectors that facilitate e-commerce sales are growing rapidly in recent years, even if they remain considerably smaller than more traditional retailers. In terms of the outlook there are a few important items to note. First, current and future retail vacancies provide a big opportunity for local communities to redeveop and rethink some of their biggest tracts of land. For smaller cities experiencing slower economic growth and even population losses, redevelopment will be challening, and replacing one retailer with another may be impossible. However for larger areas, redevelopment of land along major roads and transportation networks provides myriad opportunities. 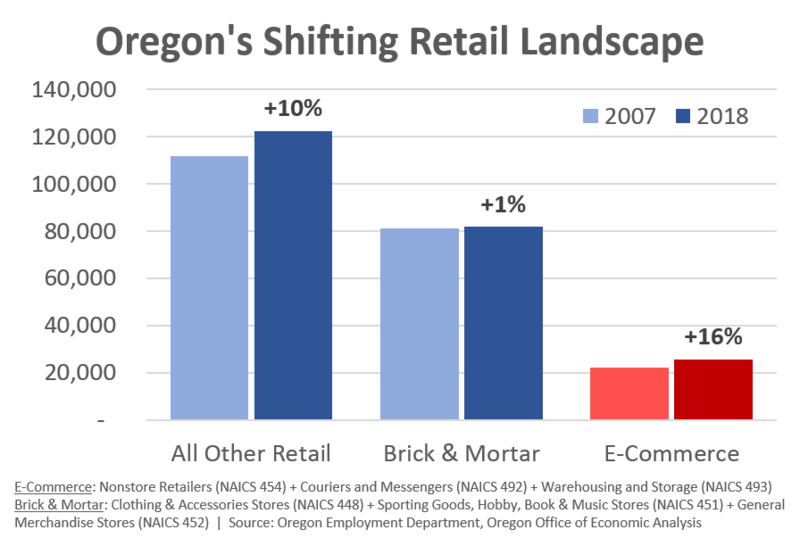 Second, our office’s forecast calls for ongoing growth in retail employment in Oregon. The old adage is retail follows the rooftops. So as Oregon’s population increases, so too will the demand for retail goods. That said, over the coming decade retail employment will increase one-third to one-half as fast as population growth. The sector will see gains, but slow ones. Retail employment relative to the size of the population is set to reach historic lows. Third, at the recent Bend Chamber or Commerce event, Tom Potiowsky, former state economist and current NERC director, put retail on the list of sectors most exposed in the next recession. I think he is right, at least those traditional brick and mortar segments most exposed to online competition. If we’re seeing flattish growth in today’s economy, a recessionary drop will push more establishments over the edge. Fourth, Conor Sen makes a lot of sense when discussing the e-commerce vs traditional retail outlook. Clearly e-commerce has won a larger and growing share of retail in the past decade, hurting traditional retailers. However, looking forward, Conor notes the drivers of these changes, and their costs may flip. With more vacant retail space in addition to more being built, rents are softening, helping retailer costs. For e-commerce they are seeing ad rates rise, customer acquisition costs increase, and running into transportation supply constraints (truck drivers, costs, congestion, etc). These shifts do not mean e-commerce will recede, but do make it more likely that the coming decade will not just be a continuation of the previous decade’s patterns.